Have you ever not felt well – did something cool – and then it blurs because you weren’t feeling well? Unfortunately that is what happened to me seeing Grayson Capps. I enjoyed the set immensely in the moment, but that night at The Shed has blurred for me quickly, so I’ve struggled on how to write this review. I did take a couple poor quality videos – but he has a really great website up that I would like to encourage everyone to take a peak at. I also see the correlation between Grayson and 60’s folk because of the sheer honesty in his music. He doesn’t back down from controversial topics, yet it would be unfair to peg him solely as a political musician, because songs like Coconut Moonshine are there to kick up your feet to. Beyond his talent and the talent of the band, they are good guys to boot. 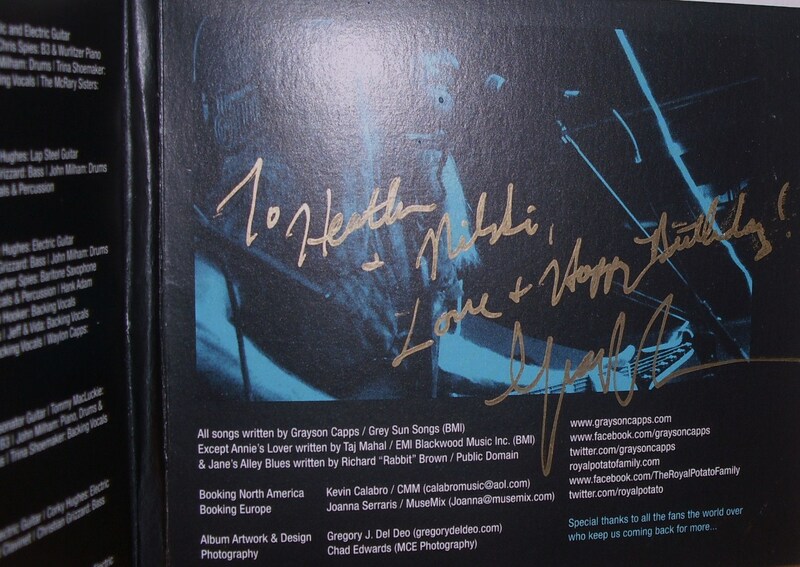 Check out this signed CD case from Grayson. This entry was posted on August 30, 2011 by 850music in Posts and tagged review.